TopX agent Sarah Packer with VJ & GL Packer, Kurrajong, Roma Charbray steers. The steers sold to 291c/kg, reaching a top of $1,066 to average $712. Cattle were drawn from the usual supply area with increased numbers of western cattle yarded. A fair panel of buyers was present and operating. The yarding was dominated by steers and heifers and quality was again mixed. Better quality lines continued to sell to strong demand. Light weight yearling steers under 280kg to restockers fell by 4c/kg. Yearling steers 280-330kg to restockers fell by 1c, while medium weight yearling steers to feed fell by 20c/kg. Light weight yearling heifers under 280kg to restockers fell by 25c, while yearling heifers to domestic feed fell by 11c/kg. Medium weight 2 score cows fell by 30c, while the medium weight 3 score cows fell by 15c/kg. A large sample of light weight yearling steers under 280kg to restockers sold to 302.2c to average 284c/kg. A good number of yearling steers 280-330kg to restockers made to 298.2c to average 282c/kg. Medium weight yearling steers to feed sold to 292.2c to average 267c/kg. Light weight yearling heifers under 280kg sold to 250c to average 221c/kg. Medium weight yearling heifers to domestic feed sold to 240.2c to average 224c/kg. Medium weight yearling heifers to slaughter made to 234.3c to average 226c/kg. Grown steers were present in small numbers. A small sample of grown heifers under 540kg sold to 230.3c to average 227c/kg. Medium weight 2 score cows sold to 187.2c to average 162c, while the medium weight 3 score cows sold to 201.2c to average 195c/kg. Heavy weight cows made to 210.2c to average 199c/kg. Light weight bulls sold to 256.2c to average 239c/kg. Weaner steers under 220kg topped at 296c/kg and averaged 239c/kg, weaner steers in the 220-280kg range reached 302c/kg and averaged 271c/kg. Steers in the 280-350kg range reached 298c/kg and averaged 271c/kg, and steers in the 350-400kg range reached 292c/kg and averaged 258c/kg. Feeder steers in the 400-550kg range topping at 284c/kg and averaging 247c/kg. Cows and calves hit $760/unit. 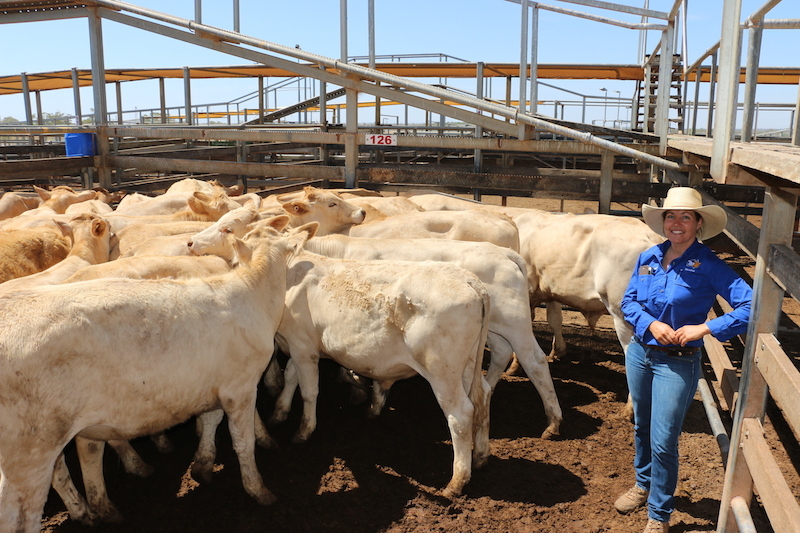 Corella Cattle Co, Corella Station sold Santa cross steers to 302c/kg, reaching a top of $835 to average $723. CJ, DM, RJ & MA Harland, Glenolive, Injune sold Santa cross steers to 298c/kg, reaching a top of $960 to average $854. The Santa cross heifers sold to 240c/kg, reaching a top of $664 to average $620. Scott & Gigi Robertson, Westwood, Mitchell sold Angus steers to 292c/kg, reaching a top of $1,089 to average $912. Charolais cross heifers sold to 240c/kg, reaching a top of $686 to average $552. Todd Cattle Co, Munnaweena, Mitchell sold Angus cross steers to 290c/kg, reaching a top of $1,168 to average $905. SD & MJ Russell, Wodonga, Mungalalla sold Charolais steers to 290c/kg, reaching a top of $888 to average $846. Benelgram Grazing Co, Balmacarra, Charleville sold Droughtmaster cross steers to 287c/kg, reaching a top of $670 to average $471. The Droughtmaster cross heifers sold to 180c/kg, reaching a top of $477 to average $263. RG Keats & Co, Cassilis Station, Richmond sold Brahman cross steers to 286c/kg, reaching a top of $582 to average $502. Malabar Holdings Pty Ltd, Arlington, Mitchell sold Charbray steers to 285c/kg, reaching a top of $1,038 to average $634. The Charbray heifers sold to 216c/kg, reaching a top of $551 to average $431. PD & SE Joliffe, Walhallow, Amby sold Santa steers to 284c/kg, reaching a top of $1,291 to average $1,291. IR & BN Hornick, Balmoral, Wallumbilla sold Charbray steers to 284c/kg, reaching a top of $738 to average $738. Seawright Investments, Comet Downs, Injune sold Santa steers to 280c/kg, reaching a top of $866 to average $797. Ian Brumpton Holdings Pty Ltd, Oaklands, Roma sold Angus steers to 280c/kg, reaching a top of $859 to average $803. JS & EM Campbell sold Brahman steers to 278c/kg, reaching a top of $918 to average $745. PA & HM Beitz, Haroldale, Roma sold Charolais steers to 276c/kg, reaching a top of $940 to average $926. Summerdell Grazing Pty Ltd, Summerdell, Jericho sold Droughtmaster cross steers to 276c/kg, reaching a top of $657 to average $548. The Droughtmaster cross heifers sold to 194c/kg, reaching a top of $443 to average $345. Gary and Carol Schefe Family Trust, Roma sold Charolais steers to 272c/kg, reaching a top of $843 to average $843. G Groves, Kalinda, Roma sold Charbray steers to 263c/kg, reaching a top of $1,022 to average $967. Heifers under 220kg topped at 211c/kg and averaged 168c/kg, while heifers in the 220 – 280kg range topped at 250c/kg and averaged 210c/kg. Heifers in the 280-350kg range topped at 242c/kg, averaging 207c/kg. Heifers in the 350-450kg range topped at 235c/kg, averaging 196c/kg. SJ & NE Ward, Taringa, Injune sold Charbray heifers to 235c/kg, reaching a top of $948 to average $758. LC & SE Malone, Braeside Station, Kynuna sold Droughtmaster heifers to 226c/kg, reaching a top of $820 to average $550. Cows in the 300-400kg range reached 161c/kg and averaged 123c/kg, while cows in the 400kg-500kg range reached 203c/kg and averaged 165c/kg. Cows over 500kg topped at 210c/kg, averaging 191c/kg.